India is like jumping off a cliff; a big cliff....with lots of cows. Before I reached the cliff I talked to as many people as I could about it; "so when you started running did you start with your right or left foot? How deep is it again? " as if their experiences would better prepare me when my time came. As I peered over the edge I could hear my heart-rate increasing and my palms perspiring. Once I mustered up enough courage to take the leap, I arm-locked with a stranger, held my breath, plugged my nose, started sprinting and before I knew it we were free-falling. No. Turning. Back. I met the stranger I leached on to, a japanese guy who fancies American hip-hop (I'll call him "Snoop Nihonjin"), at Indian immigration and we decided to stick together since we shared the same destination, Varanasi. 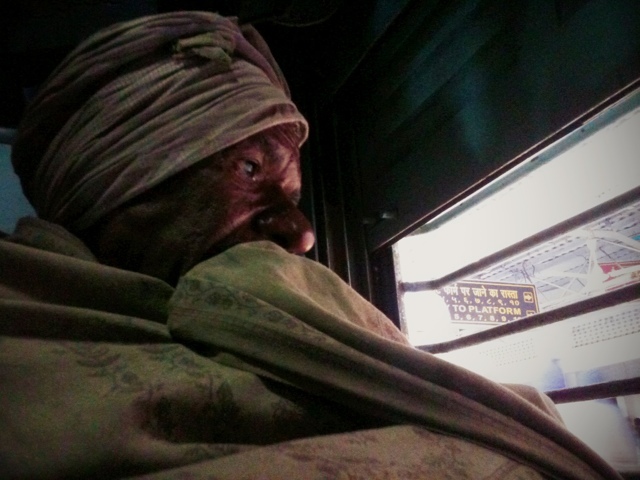 We took a relatively pleasant jeep ride from the Nepalese border to Gorakpur and then we entered the breath holding portion of our adventure: the local section of the train. Indeed the 61 rupees (about $1) for the 221 km journey was too good to be true. When we entered the train we looked around, looked at each other, looked around, looked at each other, and then stepped back onto the train station platform. 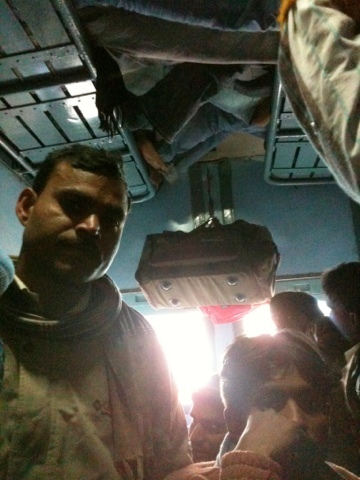 It was the local section of the train; seats were a free for all, survival of the fittest, Indian style. We gave each other a pep talk, changed into our gambatte (good luck/do your best) swim suits, plugged our noses and fought...no, we battled...for some precious floor space. I sat on my bag in between two men on seats, pressed my knees to my neck and clutched my purse. I became chummy with one of the top dogs (I'll call him "Top Dog") and he had my back (and toes) for the whole journey. 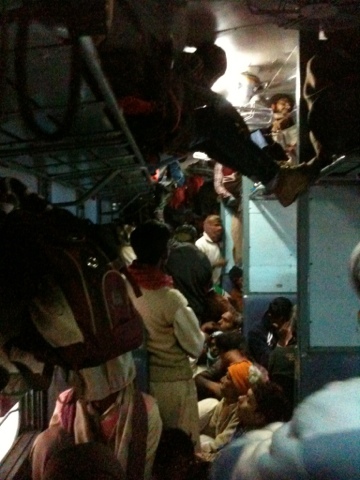 While we waited for the train to start, more and more people crammed themselves in. More and more people. When there wasn't even space for a newborn to fit unless it was levitating, 20 more people entered the train car. This went on for 2 hours (there we also people hanging on the outside of the train). I'm pretty sure physics were defied in that train. Snoop Nihonjin was continuously bumped, pushed and stepped on in his standing position in the aisle. When his bladder couldn't expand any more he ventured to ...the toilet (dun, dun, dun).....and he did not return. He ended up making friends with the boss of the toilet because they shared a love for Nepal and scored the toilet as a seat. He saw (and smelled) a wide range of things. His situation was oddly better than mine. Indian men stared at me for excruciatingly long periods of time and my body went through many stages of pain during those 8 hours. Now onto the pros: the people. Although nobody in my vicinity could speak English, their kindness was loud and clear, especially Top Dogs. I should also mention that I never felt unsafe. We all communicated in funny hand motions, head bobs and broken Nepali (it has many similarities to Hindi) and English and had ourselves a good time. If there's one thing that Indians have, it's a sense of humor. I gratefully accepted the chai Big Dog bought me and watched others share snacks (I declined in fear of food sickness). Some would even take turns sitting and standing with strangers and most looked out for the women (which was about 2-3%). 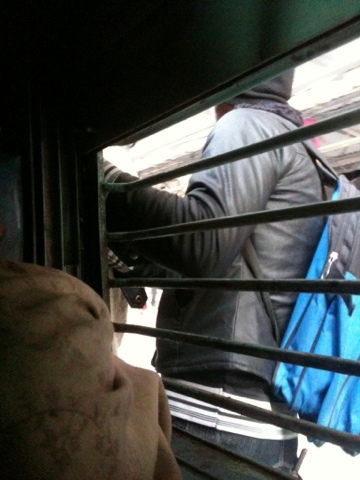 Although it was far from a comfortable ride, I left that train with a couple dozen new friends and a newfound respect for Indian people who know nothing different from the non-reserved section. One of my biggest goals while traveling is to rid myself of entitlement. Hierarchy is definitely present outside of the caste society and I don't want to perpetuate this cycle. I don't deserve a seat on a train more than the next person. In all honesty, I have saved up enough money to travel in relative luxury. I can afford to spend more than $4 a night for accommodation and to fly from city to city but that would just be putting one more barrier between me and the locals; I want to be on the ground, at eye-level with them. There is a difference between need and want and I need to keep myself in check. I don't know if I will brave the non-reserved section again but I will, however, remember the great people that I "got cozy" with on my way to Varanasi.